In honour of π day (03.14 – can’t wait until 2015~) , I thought I’d share this little script I wrote a while back for an introductory lesson I gave on using Monte Carlo methods for integration. The concept is simple – we can estimate the area of an object which is inside another object of known area by drawing many points at random in the larger area and counting how many of those land inside the smaller one. The ratio of this count to the total number of points drawn will approximate the ratio of the areas as the number of points grows large. If we do this with a unit circle inside of a unit square, we can re-arrange our area estimate to yield an estimate of π! 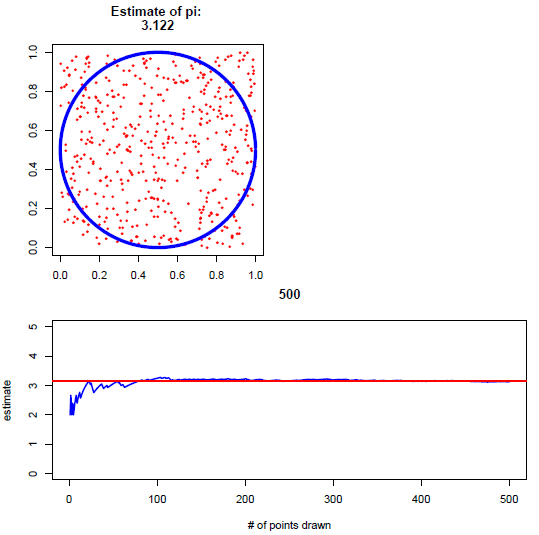 The resulting plot (multi-page pdf) lets us watch the estimate of π converge toward the true value. At 500 sample points, I got an estimate of 3.122 – not super great. If you want to give your computer a workout, you can ramp up the number of iterations (N) and see how close your estimate can get. It should be noted that this is not an efficient way of estimating π, but rather a nice and simple example of how Monte Carlo can be used for integration. In the lesson, before showing the simulation, I started by having students pair up and manually draw points, plot them, and calculate their own estimate. If you use this in your classroom, drop me a note and let me know how it went!